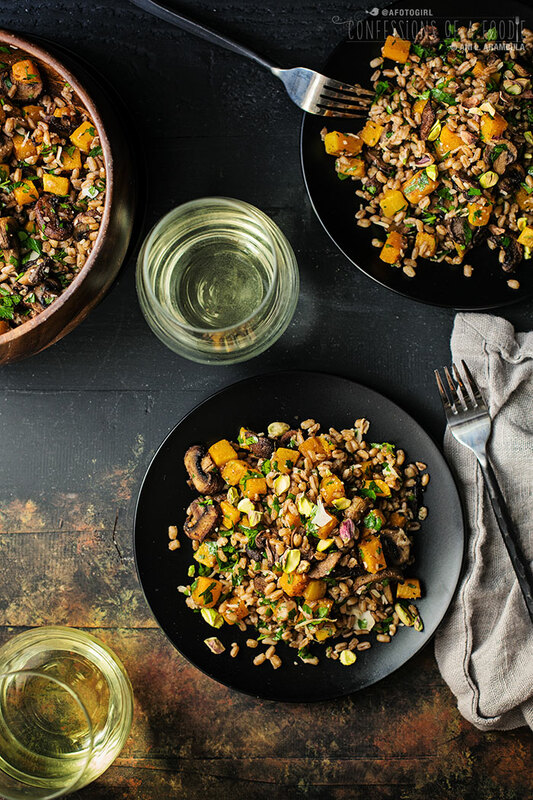 Farro, a healthy ancient whole grain, meaty mushrooms and sweet butternut squash come together in a warm salad perfect for Meatless Mondays. One of my guilty pleasures is risotto. Especially creamy, cheesy mushroom risotto. I can't remember the last time I indulged. With it's high caloric value, blood sugar-spiking starch, and often large amounts of cheese, it's not a dish I can eat these days. That's how this dish was born. I wanted something that hinted of mushroom risotto but wouldn't throw my hours of working out with my trainer out the window. I've replaced the quick blood sugar-spiking arborio rice for healthier, chewier farro, an ancient grain dating back to the earliest of farming days. I dry toast it first, bringing out the grain's natural nuttiness then it's simmered it with a cinnamon stick to add even more earthiness and warmth. 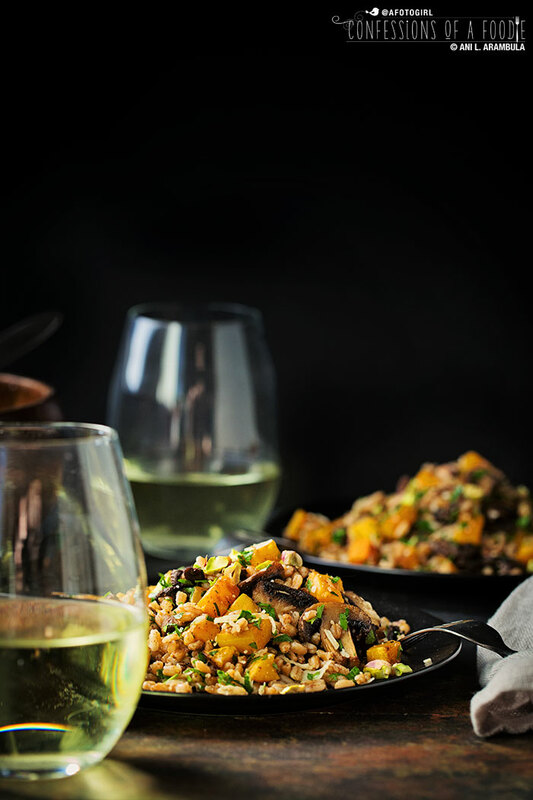 The mushrooms and bite-sized butternut squash are sprinkled with a bit of extra virgin olive oil then tossed in a custom blend of warm spices before quick roasting in a super hot oven. With roasting, the mushrooms take on a meatiness while the butternut squash provides juicy pops of creamy sweetness. For a bit more depth, parmesan three ways is added at the end, while the veggies and farro are still warm from cooking. Right before serving, a good handful of chopped parsley adds color and provides freshness while a light garnish of chopped pistachios adds crunch. Served while still warm or at room temperature, this salad is a healthy meal for a Meatless Monday or a Lenten Friday. I hope you enjoy it as much as I do. Place a medium saucepan on high heat. 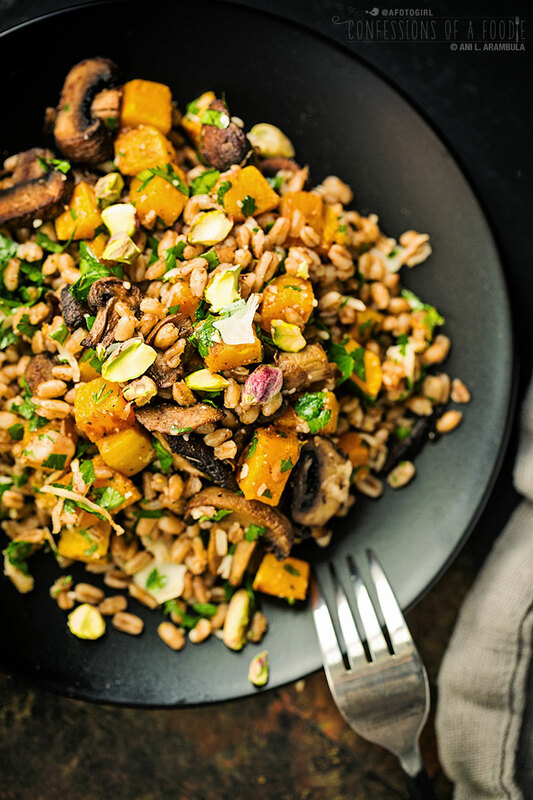 When pan is hot, add the farro and toast grains, stirring every 10 seconds for 2 minutes. Add enough water to cover farro by 1 inch and add the cinnamon stick. Bring to a boil, then cover, reduce heat and simmer for 15 minutes. At 15 minutes, turn heat off and let farro sit for 5 minutes. 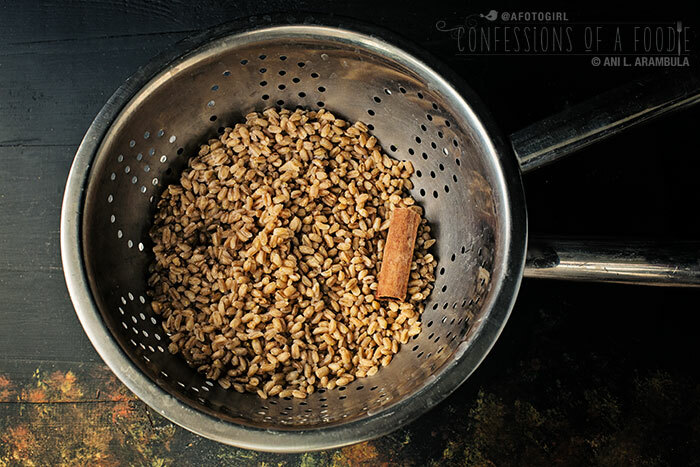 Drain farro, place in a large bowl discarding the cinnamon stick, then set farro aside. While farro is cooking, preheat the oven to 450 degrees Fahrenheit. 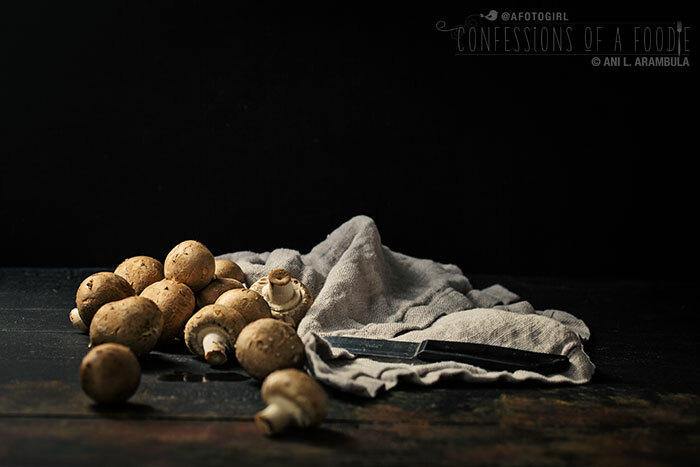 Wipe mushrooms down with a paper towel, trim off ¼-inch of the stem, discarding the ends, then slice the mushrooms into thirds. Place them on a low rimmed baking sheet and set aside. 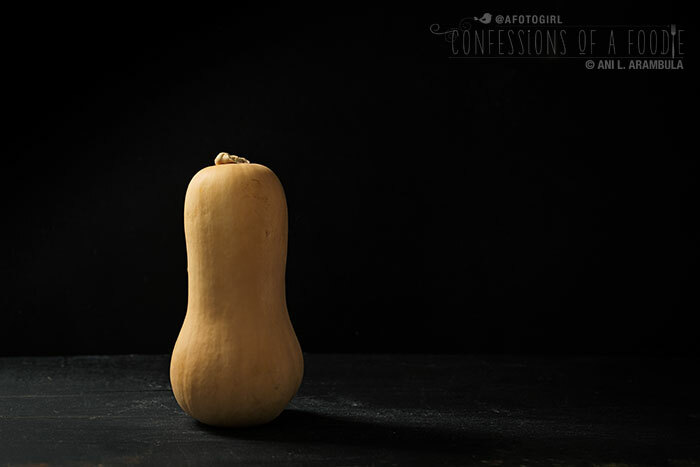 Trim away the top, stem part of the butternut squash then cut the squash at the base of the neck, saving the bulb of the squash containing the seeds for another use. 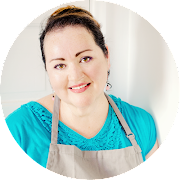 Using a sharp knife or a vegetable peeler (my preferred method on younger, smaller squash), peel away the skin and discard it. Cut the squash into roughly ½-inch thick slices. Stack the slices and cut into ½-inch thick matchsticks. Then cut across the matchsticks, making cubes. Place the squash into the pan with the mushrooms. Drizzle the vegetables with the olive oil. In a small bowl, stir together the spices from the salt through to the nutmeg until well blended. Toss the vegetables with the spices to coat well and as evenly as possible. Place the baking sheet in the oven and roast for 12 minutes. Remove the pan, stir the vegetables, return the pan to the oven and roast an additional 12 minutes. 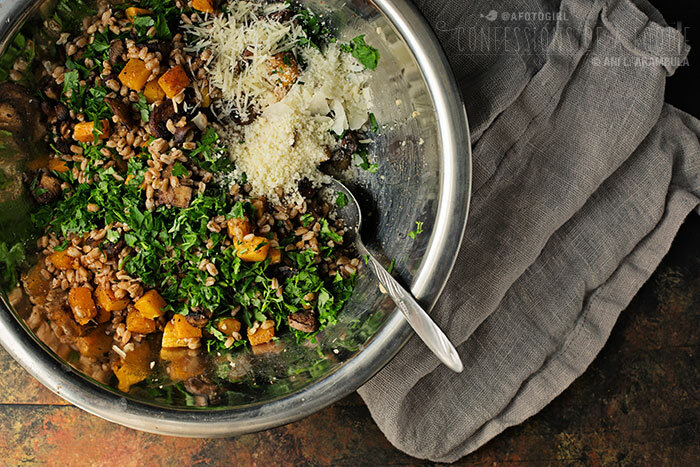 When vegetables are done, add them to the bowl with the farro. Throw in the parmesan and parsley, tossing to incorporate. Divide among four bowls and garnish each serving with pistachios. Adjust salt and pepper to taste. Nutritional information on 'Confessions' is approximate and is intended as a guide. Data is calculated on MyFitnessPal and can vary depending on which products you use as well as measuring accuracy. 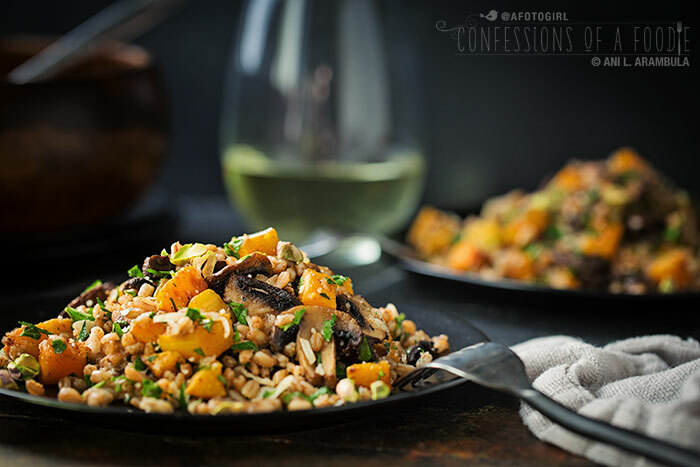 Such gorgeous photos and wonderful meatless recipe to share! 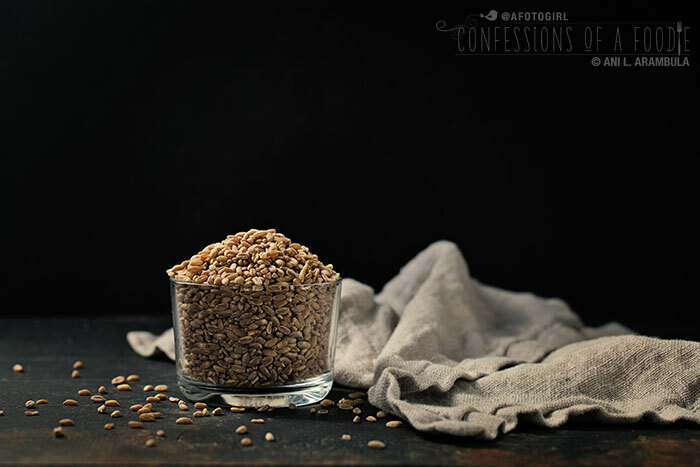 The spices bring this faro dish to life, a wonderful post!